Land Pooling project at Kathmandu is successful in converting agricultural land into urban with the infrastructures but it has not increased in the supply of serviced plots to low income group. Even though there is the mechanism of cross subsidy for low income group within land pooling as given by Town Development Directives (TDD) 2005 of Nepal that “up to 10% of the reserve plots could be allocated for low income and the excluded people”, it is not being implemented in any of the projects. 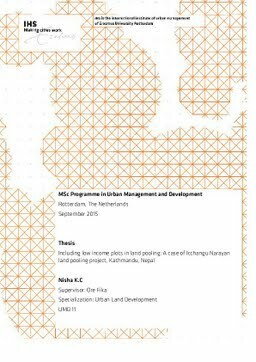 This research is about Icchangu Narayan land pooling project at Kathmandu which is a unique case in context of Nepal. It is the only case in Nepal in which government has bought land from the reserve plots of land pooling in order to construct apartment building for low income people instead of getting it as a provision given by TDD. This research in this context is carried out to explain the factors that have influenced the abandonment of the inclusionary provision in Icchangu Narayan land pooling project. Moreover identification of the reasons behind the abandonment of inclusionary provision will help government to overcome it which then drives towards the aim of capturing values from land pooling for affordable plots. This research is an explanatory research and the research strategy used is single holistic case study. It has analysed the unique case of Icchangu Narayan and has explained the factors provided by literature in relation to the events of the context. This research deals with the qualitative data and has used semi-structured interviews, observations and official documents for the collection of primary data. Likewise secondary data sources were different legal and policy documents, literatures and newspaper which helped to increase the validity of the research through data triangulation. Moreover purposive quota sampling was used and government officials from Department of Urban Development and Building Construction and Kathmandu Valley Development Authority and land owners associated with the users committee of Icchangu Narayan land pooling project were taken into sample for the interview. Furthermore the interviews were transcribed and then analysed using Atlas-Ti software for the results. Analysis of the primary and the secondary data gave the findings that the inclusionary provision was not designed properly into the legal and policy framework and it is not enforceable. Government has not initiated the provision in practice and officials have the view that it is unfair for land owners to bear the cost of everything as the project is completely financed from their contribution and government has not put any share. Furthermore land market of the area is found active at present which was able to increase the land values drastically. However in the beginning it was difficult to sell the reserve plots as people were waiting for infrastructure. Also it was found that due to the uncertainty of market, low income plots could not be designed anticipating market rate buyers will pay for that. Therefore if the inclusionary provision has to be enforced, there would be two things; either the land owner’s contribution has to be increased or they would have to compromise with the quality of infrastructure. In both cases, land owners would have to pay and they would not support for that. It was found that inclusion has never decreased the land prices. Nevertheless analysis shows that people are worried and curious about the identity of their new neighbours whom government is bringing in their neighbourhood.